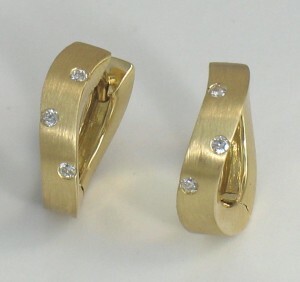 Wonderful Hinged Hoop Huggie Earrings with diamonds. Fine craftsmanship from Germany. We have admired the work of Gathmann and especially the Hinged Hoop Huggie Earrings. Now we are finally carrying their product and could not be more pleased. We love the work that we do, but we also appreciate and respect the work of other artist and designers which is why we display the work of many artists and designers along with our own work. We hope you appreciate these earrings also.